Coast Guard Boat I’s detail and emphasis on light, embodies Edward Hopper's aesthetic from the summer of 1929, as the majority of his work from the period was in watercolor (estimate: $1,000,000-1,500,000). Hopper preferred to use watercolor for his New England works as this medium was conducive to working en plein air and provided him a freedom not afforded by oil paint. 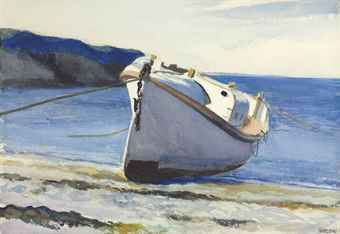 As is the case with Coast Guard Boat I, Hopper often used water in his work as a means of introducing an element of motion into a scene that is otherwise dominated by stillness. The beauty of Coast Guard Boat I lies in the contradiction between weightlessness and heft, motion and stillness. This tension is echoed by the ropes, which tether the boat to the shore. At once wanting to be of the sea yet firmly harnessed creates a sense of restlessness and even agitation to the otherwise serene, idyllic image. 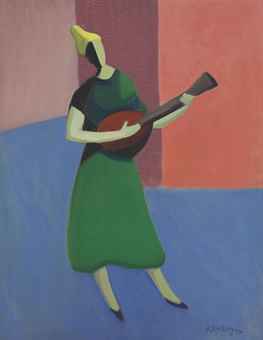 Milton Avery’s The Mandolin Player ( estimate: $800,000-1,200,000) is just one of the six works from his collection to be included in the sale of American Art. The highly saturated palette of greens, blues, oranges and pinks is representative of Avery’s works from the mid-1940s, as is his rendering of expressive figures through a contained, plastic two-dimensional design. The interconnectedness of music and the formal components of visual art had been explored by American Modernists such as Arthur Dove and Georgia O'Keeffe in the 1910s and 1920s and were championed by European abstract painter, Wassily Kandinsky. Avery had likely been exposed to Kandinsky's work while exhibiting at the Valentine Gallery on 57th Street in 1935. Avery explored the topic in a more literal approach, demonstrating his ability to blend modern themes and broader European influences while remaining committed to a familiar subject, thus creating his own style. George Inness’s (1825-1894) treatment of the landscape, particularly in his later work, is marked by a more subjective and ultimately more modern aesthetic than that of his contemporaries. The innovative brilliance of his art eventually brought him high acclaim--particularly for the later landscapes of which Summer, Montclair of 1887, is a notable example (estimate: $600,000-800,000). In Summer, Montclair, Inness presents a pastoral scene with a village church spire on the horizon and stream and grazing cattle in the distance. Beginning in 1884, Inness was able to achieve a complete synthesis of his innovative formal means and his goal of poetic expression. The central component of this synthesis was color, which he described as ‘the soul of a painting.’ Forms, on the other hand, though still based in the observation of nature, were softened by atmosphere and dissolved by light. Inness relished in capturing the colors of dawn, dusk, twilight, moonlight, the colors of all seasons and of all hours of the day. However, unlike the Impressionist painter Monet, Inness did not focus on the implied optical effects of motion or action, he instead created a dreamy stillness giving a sense of calmness. Childe Hassam's stunning Impressionist work, Evening in the Rain, ( estimate: $1,000,000-1,500,000) captures a picturesque moment on a rain drenched sidewalk of lower Fifth Avenue. Hassam's passion for capturing the cityscapes that surrounded him immediately found direct expression in the works he produced, and critics quickly came to associate him with New York. In order to capture the ever-changing scenes around him, Hassam often executed quick sketches while seated in a cab or standing on the street. 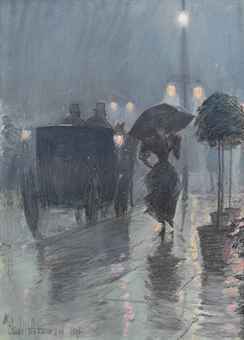 From the vantage point of the viewer, it seems entirely likely that Hassam sketched the composition for Evening in the Rain while out on one of his many jaunts around the city. The work includes all of the hallmarks of Hassam's celebrated works from the 1890s. Reflecting his fascination with his urban surroundings and the people that he encountered, Hassam pays homage to the city and captures the spirit of the end of the century in New York. Hailing directly from a descendant of the sitter, John Singer Sargent’s Mrs. William George Raphael (estimate: $4,000,000-6,000,000) was painted in London in 1906 at the height of Sargent’s unparalleled level of success and when he had reached a mastery of his craft. Mrs. William George Raphael is a grandiose and engaging painting that is a masterwork of Sargent's later portraits. Following Sargent's enormous success in the United Kingdom and the United States by 1900, the artist had gained international celebrity and his clientele expanded upward from the high bourgeoisie to the aristocratic who now sought to have their image captured by the top portraitist of the Gilded Age. As is typical in Sargent's best portraits, Mrs. William George Raphael conveys the sitter's character as a forceful presence, combined with a quality of elegance and social ease. Mary Cassatt’s Girl in a Hat with a Black Ribbon (estimate: $400,000-600,000).